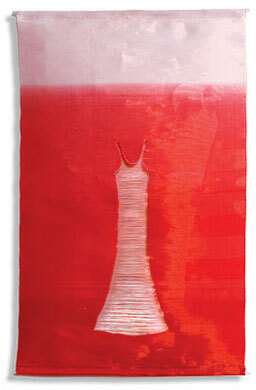 Ame II (Rain), Kay Sekimachi , linen, polyester, transfer dye, textile paint, plain and twill weave, 44″ x 6″, 2007. Photo by Tom Grotta. 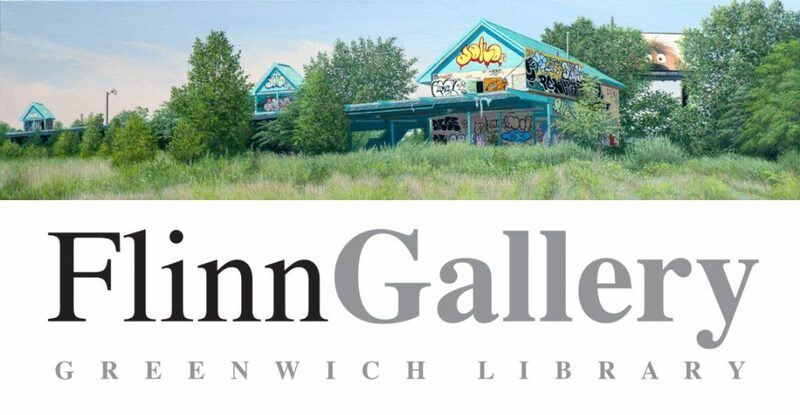 We are continuing our celebration of New York’s Asian Art Week in this post. Many of the artists who work with browngrotta arts have spent time in Japan, studied Japanese art or methods or simply cite Japan as an important influence. 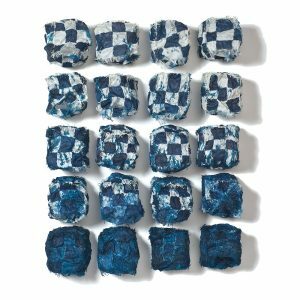 Check out the Selvedge magazines Japan Blue issue, published in August that includes an article on Naomi Kobayashi and one, by Rhonda Brown, about the influence Japan has had on four artists who work with bga HERE. Examples of this influence abound. Kay Sekimachi, for example, is a Japanese American, born in the California Bay area. During World War II, she was interned with her family in relocation centers for two years. There she learned origami and to paint and draw. She did not visit Japan until 1975, but she has said that when she reached her mother’s village, “I felt like I was coming home.” She brought back silk cocoons and later her aunt sent her banana fiber from Japan that she incorporated into her paper bowls. 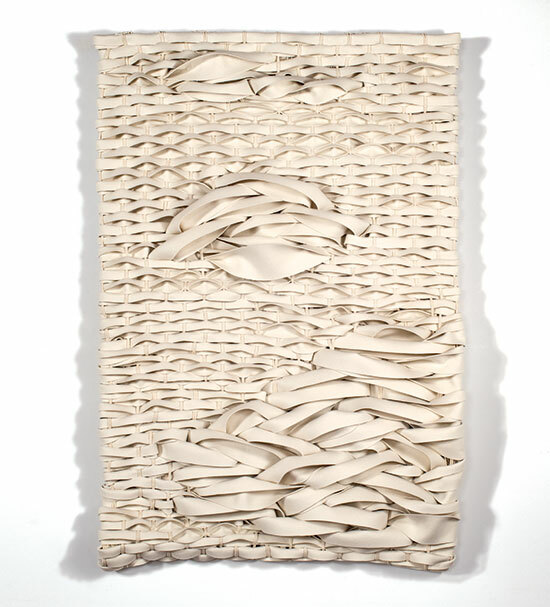 References to Japan in her oeuvre are inescapable — from the towers she has created from antique Japanese paper, to the delicate flax and paper bowls she makes in shapes that mimic Japanese porcelain to her series of takarabako or woven boxes. New Nebula, Eduardo Portillo & Mariá Eugenia Dávila , silk, alpaca, moriche palm fiber dyed with Indigo, rumex spp, onion, eucalyptus, acid dyes, copper and metallic yarns, 74” x 49.25”, 2017. Photo by Tom Grotta. 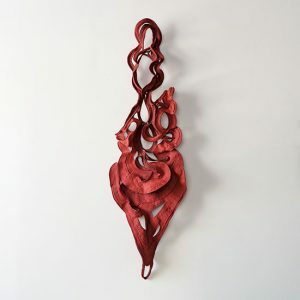 Jennifer Falck Linssen uses an ancient Japanese paper carving skill – katagami – to create her. Katagami are handcarved flat paper stencils. This 1,200-year-old technique is traditionally used to resist-print kimono textiles in katazome. 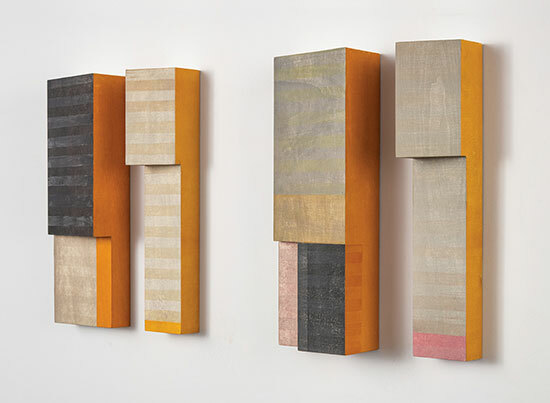 By drawing with a small knife on mulberry and cotton papers and shaping this carved paper into three-dimensional sculpture, Linssen recontextualizes the humble stencil – sculpting forms of pattern, shadow, and light. 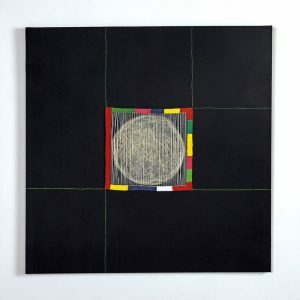 K Yama-Dori, Katherine Westphal, paper and linen, 40″ x 45″, 1983. Photo by Tom Grotta. 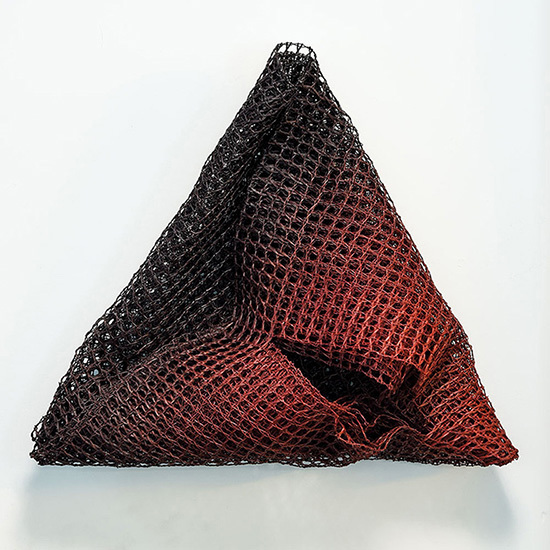 In Venezuela, Eduardo Portillo and Maria Eugenia Dávila, create complex textile works of multiple materials. Their works are woven using Orinoco moriche palm fiber, wool and cotton, dyed with indigo, cochineal and eucalyptus, copper and metal yarns and their own cultivated silk — as they have established the entire process of silk manufacture growing mulberry trees on the slopes of the Andes, rearing silkworms, obtaining the threads, coloring them with natural dyes. 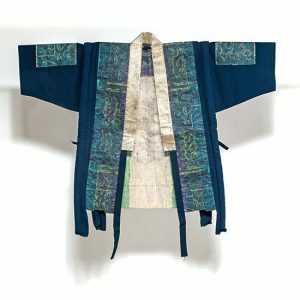 The couple devoted 10 years to the study of indigo dye and its culture in Japan and other countries in Southeast Asia before embarking on this work. They aim to promote an understanding and appreciation of natural dyes as an element in textiles, its importance as a means to preserve and disseminate cultural values and as a medium of contemporary expression. 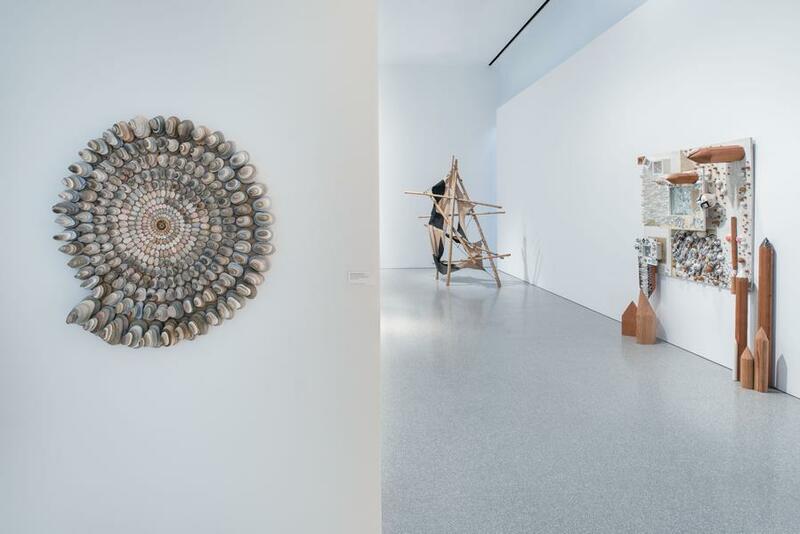 For Katherine Westphal, the influences of ethnic and folk art — African, Japanese and Indonesian were found in her textiles, sculptures, baskets, prints, drawings and items of wearable art. She created many garments inspired by ethnic clothing – primarily Japanese and Chinese prototypes. Her participation in the Wearable Art movement validated this activity, writes JoAnn Stabb, and brought it recognition. 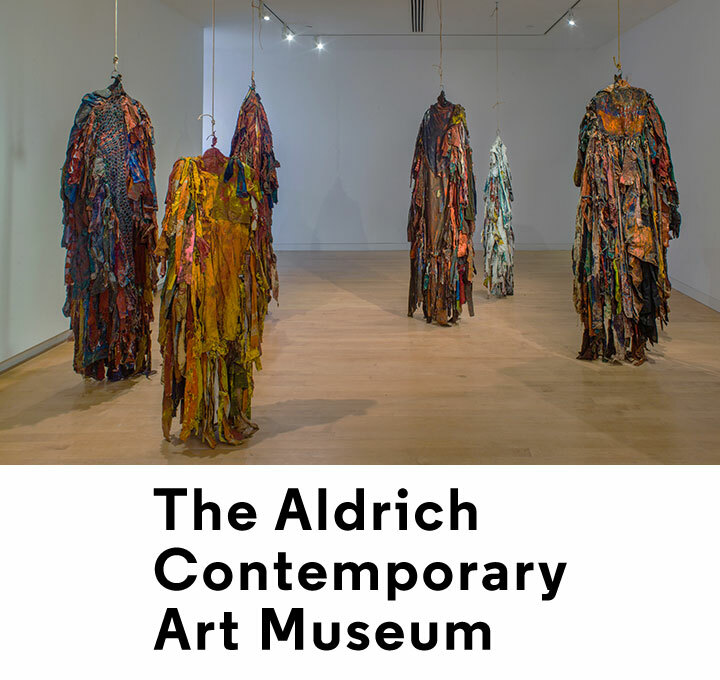 In particular, at the invitation of the American Crafts Council headquarters in New York, she led a four-person contingent who presented several lectures and workshops on “Wearable Art from North America” at the World Crafts Council international symposium in Vienna, Austria, in 1980. 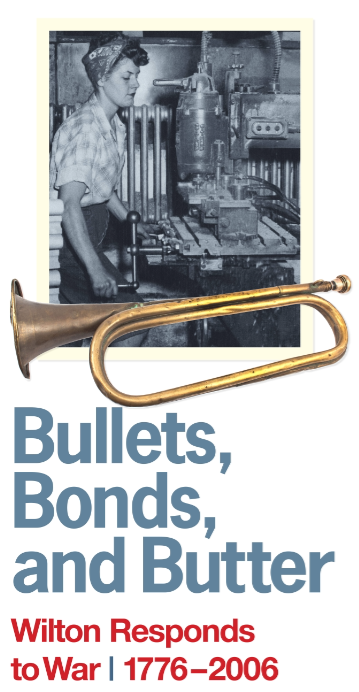 “I am interested in the ‘traditional’ as a reference point, not as a boundary,” says Nancy Moore Bess. A California native, Bess has lived in Japan and authored, with Bibi Wein, Bamboo in Japan (Kodansha International, Tokyo, Japan 2001). 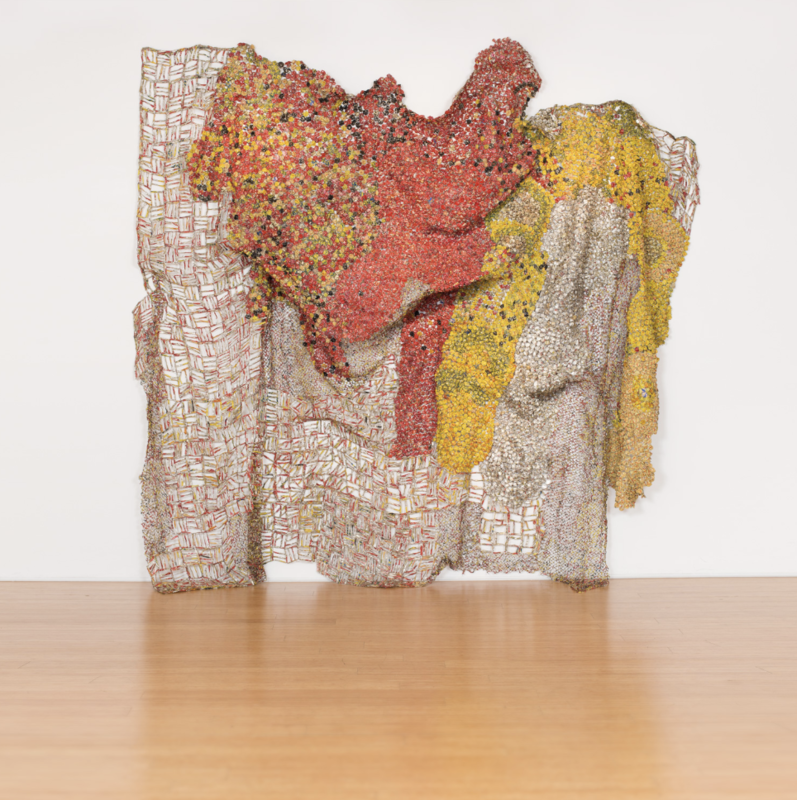 Her first trip to Japan in 1986 defined the course of her work for the next three decades. 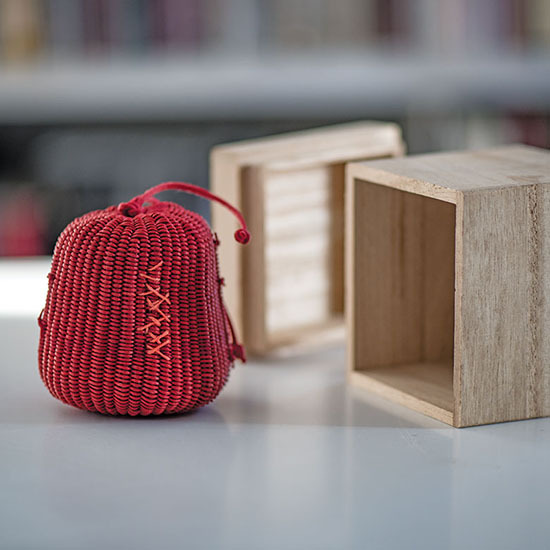 “Japan has influenced my work in many ways,” she writes, “but they all overlap – traditional packaging, basketry, bamboo, the crossover influences of East/West, the vocabulary of defining beauty and craftsmanship.” In works like Boxed Packages, one can find allusions to packaging techniques like tsutsumu. Other works reference traditional forms such as tea caddies. Her Sabi Tea Jar series, for example, was inspired by old, sometimes rusty, water jars used in tea ceremony that she found at flea markets. Don’t forget to check out our online exhibition, An Unexpected Approach: Exploring Contemporary Asian Art Online by visiting browngrotta arts’ YouTube channel (HERE) and view each individual work in the exhibition on Artsy (HERE). (Right) Ceramic 50, Yasuhisa Kohyama. For the 10th year, New York is celebrating Asian Art Week from March 13th – 23rd and we’ve prepared related programming of our own. Through the end of this month, browngrotta arts is presenting An Unexpected Approach: Exploring Asian Contemporary Art, an online exhibition featuring 21 accomplished artists from Japan, Korea and the US, whose work reflects a contemporary Asian sensibility. More than three dozen works are included in the exhibition. 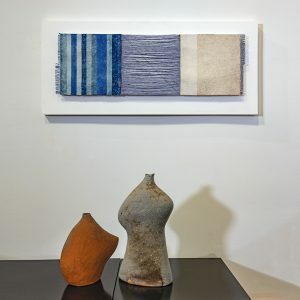 including select works of ceramic, textile, basketry and sculpture. The artists in this exhibition, including Jiro Yonezawa, Yasuhisa Kohyama, Glen Kaufman and Shin Young-Ok, have an understanding of traditional processes and aesthetics, but apply this understanding in a contemporary manner. Conventional Asian materials and/or techniques are featured, but often used in unconventional ways. 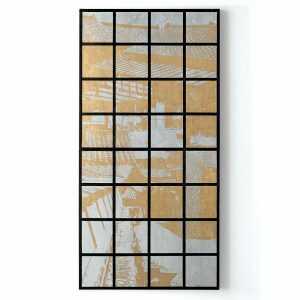 Indigo Grid, Kiyomi Iwata, silk organza, 39″ x 29″ x 5″, 2011. Photo by Tom Grotta. Kiyomi Iwata, for example, who has lived in the US for many years, explores the boundaries of East and West using silk organza metal. She creates sculptures that combine traditional Japanese aesthetics — organza boxes with kimono references – in minimalist grids, forms common in contemporary Western art. 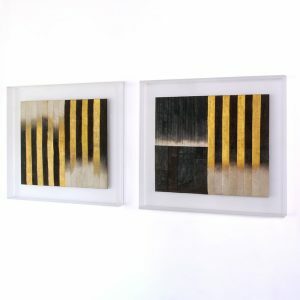 Jin-Sook So’s work is informed by time spent in Korea, Sweden and Japan. So uses transparent steel mesh cloth, folded, stitched, painted and electroplated to create shimmering objects for the wall or tabletop. The past and present are referenced in So’s work in ways that are strikingly modern and original. 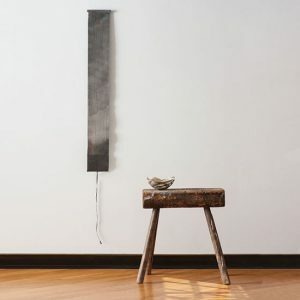 She has used old Korean schoolbook pages to create collage and steel mesh to create contemporary pojagi and to re-envision common objects — chairs, boxes and bowls. 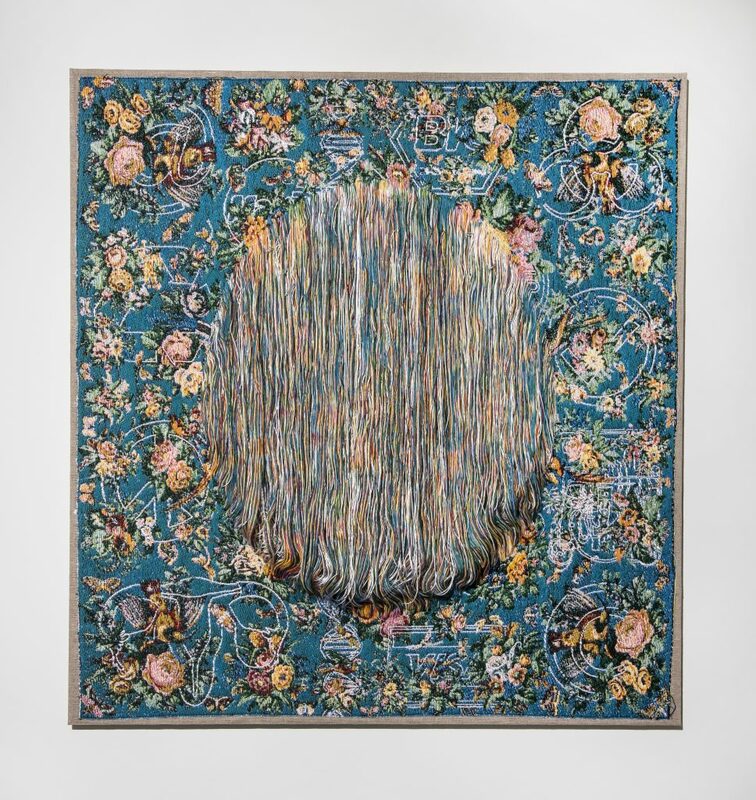 Lyric Space, Shin Young-Ok, Korean silk fabric and handmade ramie threads, 26.4″ x 26.4″ x .75″, 2014. Photo by Tom Grotta. 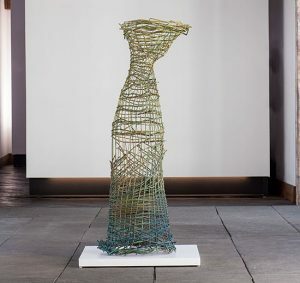 Kyoko Kumai, the subject of a solo show at the Museum of Modern Art, also works in steel, using steel threads to weave or spin strikingly contemporary clouds of steel. 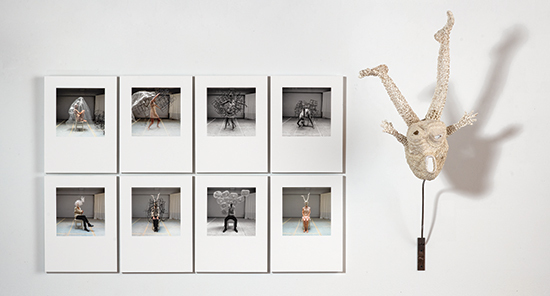 Jiro Yonezawa has received numerous awards for his bamboo vessels and sculpture. Formally trained in Beppu, Japan, Jonezawa then moved to the US, and when he did so, the lacquered twill-patterned form associated with Beppu was transformed by the artist into sensuous sculptural vessels, formal yet more freely formed. You can view An Unexpected Approach: Exploring Contemporary Asian Art Online by visiting browngrotta arts’ You Tube channel. You can see each individual work in the exhibition on Artsy. Structural Discussion VI, Hisako Sekijima cedar and walnut, 10.75” x 14.5” x 7”, 2016. Photo by Tom Grotta. Winter is slowly but surely coming to a close (finally!) and the sunny months are not too far ahead. Also rapidly approaching is this year’s Art in the Barn exhibition: Art + Identity: An International View, which seeks to take an expansive look at identity and art in a global context. 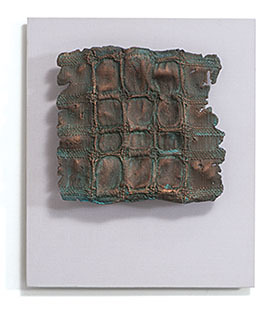 We started February’s “New This Week” series with Structural Discussion VI by Hisako Sekijima. Woven using cedar and walnut, Sekijima’s Structural Discussion VI’s explores structure, form and shape. 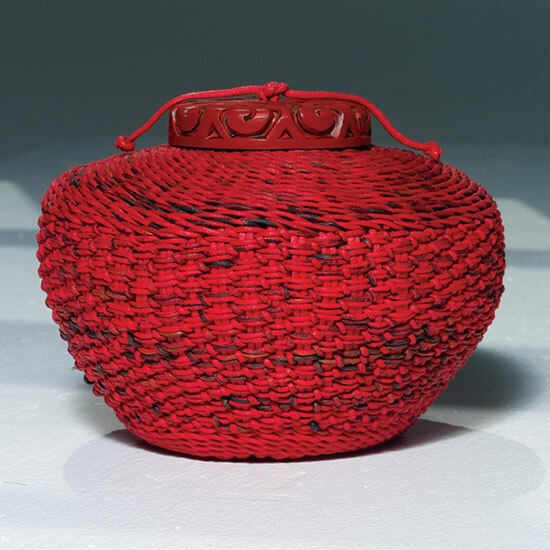 Though Sekijima’s baskets were not created to function in a utilitarian manner she feels that they have been a useful tool in exploring herself. 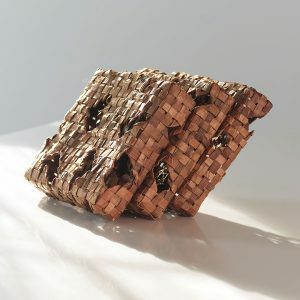 Unlike traditional basketmakers, Sekijima has chosen to not work with one specific plant throughout her life, but instead work with various plant materials. 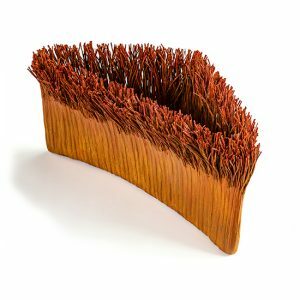 Her openness to other plant materials has allowed her to explore and experiment with each material’s sculptural possibilities. 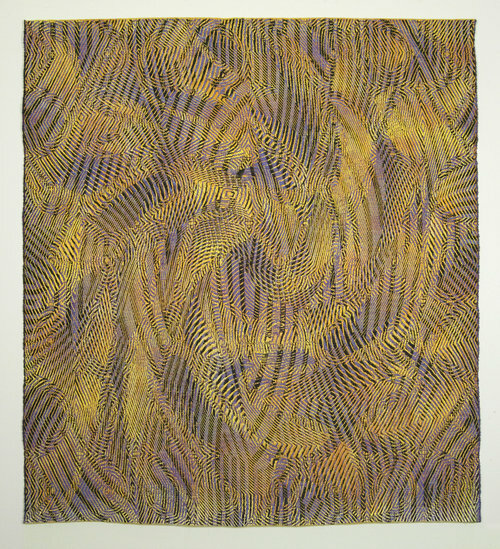 Material Pleasures: Artemisia, Lia Cook, acrylic on linen, dyes on rayon; woven, 53” x 77” 1993. Photo by Tom Grotta. The sensual nature of Lia Cook’s Material Pleasures: Artemisia is sure to immediately captivate the viewer. Cook’s Material Pleasures series explores the “sensuality of the woven image” and the emotional response that comes with it. Cook has continued this exploration of sensuality and emotion in her current work, combining it with technology that measures and maps emotional responses. Orchid, Marianne Kemp, horsehair, gold lures thread, wooden frame, 15” x 18.5” x 2”. Photo by Tom Grotta. Next up was Marianne Kemp’s stitched and woven Orchid. 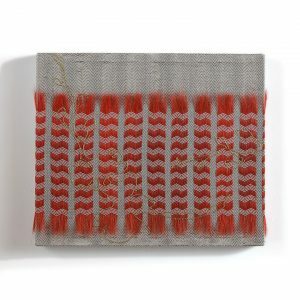 Dyed red horsehair woven in between a delicate herringbone background brings light to Kemp’s supreme eye for detail. For Kemp weaving is a form of meditation. “It is the only time of day that I do one thing at the time and think (solely) about one thing,” Kemp explains. 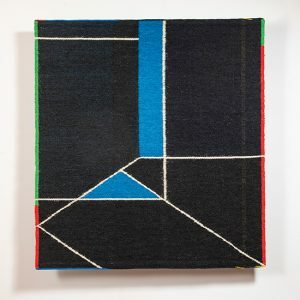 Weaving allows Kemp to give her brain a rest and explore her creative intuition. 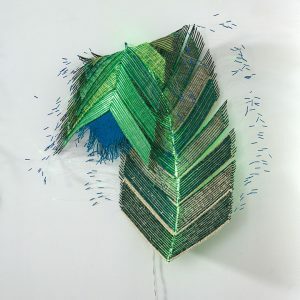 Blue/Green Weaving, Włodzimierz Cygan, polyester, linen, sisal, fiber optic, 41” x 41” x 15”. Photo by Tom Grotta. 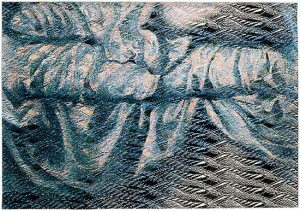 We concluded February with Włodzimierz Cygan’s Blue/Green Weaving. 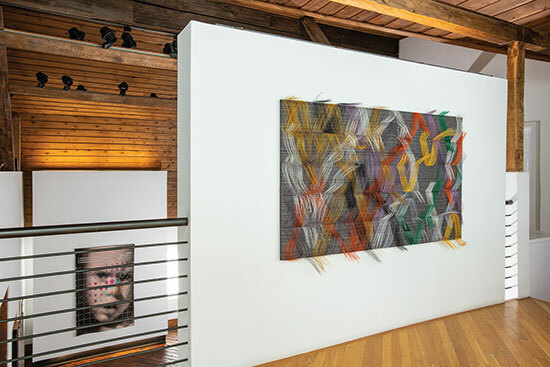 The piece, which is designed with both textiles and fiber optics, resembles a peacock feather in daylight and slowly shifts shades in the dark. 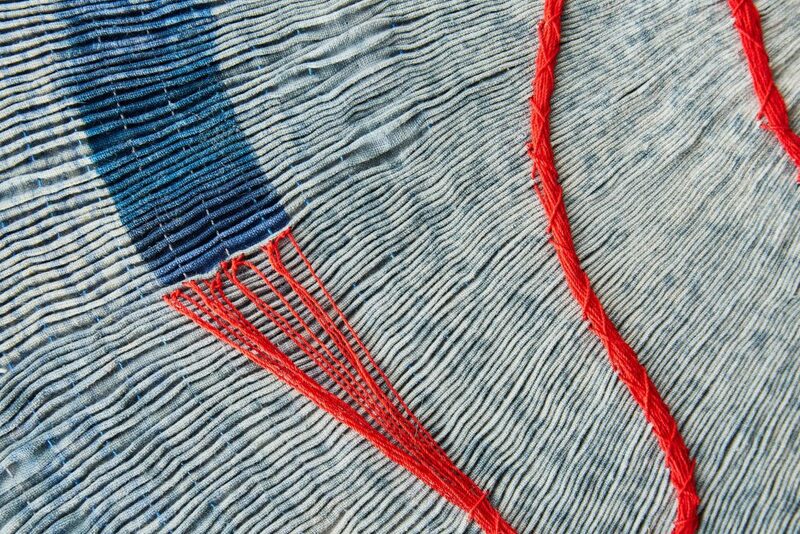 Cygan, a Polish artist, is an innovator in the field of fiber art, challenging the boundaries of the medium. 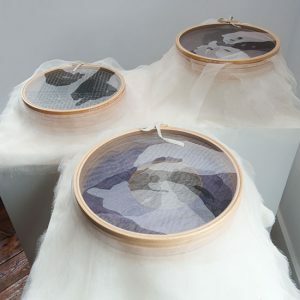 In an artspace article last spring, “8 ‘Unbeweavable’ Textile Artists Redefining the Traditional Medium,” the author, Jillian Billard, profiled eight contemporary textile artists who keep the historical and cultural significance of the medium in mind, while addressing topics ranging from colonialism, to power dynamics, to disposal and regeneration. 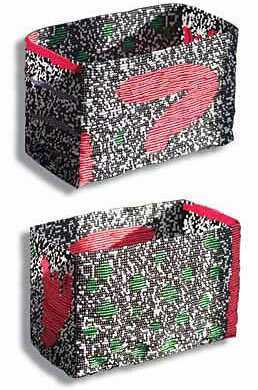 2.75″ x 17″ x 17″; 5″ x 17″ x 17″; 6″ x 17″ x 17″, 2011. Photo by Tom Grotta. Deborah Valoma in her Studio in Minnesota. Photo by Tom Grotta. Deborah Valoma is an artist and historian. 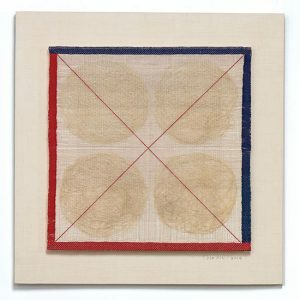 Intensely research-based, her studio practice harnesses the nuances of the humble, yet poetically charged textile medium. 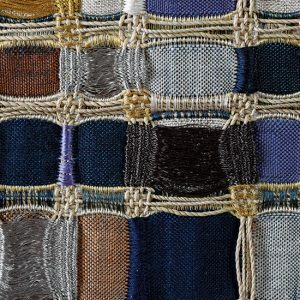 Using hand construction techniques and cutting-edge digital weaving technology, her work hugs the edges of traditional practice. She upholds traditional customs and at the same time, unravels long-held stereotypes. Drawing on a growing body of scholarship on textiles, she has developed a rigorous series of textile history and theory courses for students from differing disciplines interested the theoretical discourses in the field of textiles. Valoma believes that students must locate themselves within historical lineages in order to understand the historical terrain they walk (and sometimes trip) through daily. Historical analysis draws a three-dimensional spatial and temporal map, providing much-needed reference points. 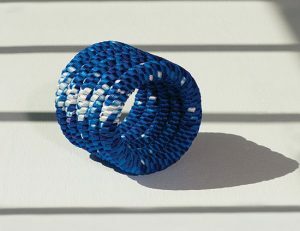 coiled and twined waxed linen thread, 54” x 16” x 4”, 2017. Photo by Tom Grotta. 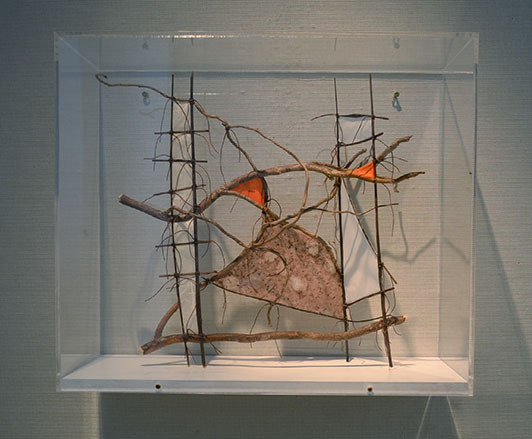 Regeneration is a theme in the work of both Karyl Sisson and Wendy Wahl. Sisson give new lives to common domestic items like paper drinking straws, zippers and measuring tales. 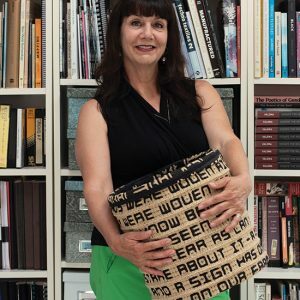 Wahl’s work with repurposed encyclopedias raises questions about how we process information, use resources and assign value to things.